Solar Power Plants are the Future of Texas Power. Every Time. Something unprecedented just happened on the renewable energy front in Texas that is likely to reverberate in energy markets across the country. ERCOT, the entity that manages the flow of electric power to some 24 million Texas customers, representing about 90 percent of the state’s electric load, has posted its predictions of where the state will be able to find the cheapest electricity over the next 15 years. Insiders knew this was brewing, and a formal discussion in planning circles is scheduled for June 21. As it usually does, ERCOT looked at a range of scenarios. The group mapped potential bulk power purchases from 2017 to 2031 under six different scenarios, including low gas prices, high economic growth, etc. And here’s the part that marks a momentous tipping point: solar power emerged as a clear economic winner in the state in all seven scenarios. In other words, ERCOT is saying that the price of solar power in Texas is now low enough that it predicts no other power plant types will be built. In 6 of 7 scenarios, solar is the only type of power plant the Texas grid operator projects will be built between 2017-2031. Graphic: ERCOT. It’s hard to overstate what a remarkable change this under-the-radar industry assessment represents. First of all, this happened in Texas, where competition to supply electricity is unfettered, and existing power plants have no guarantees or privileged status. In this environment, ERCOT is showing that solar is priced low enough to beat the cost of other new plants. ERCOT’s predictions follow several reports that Texas solar projects have sold energy at ground-breaking low prices. Certainly, Texas benefits from the wide expanses of land and ample sun, but it is just a matter of time and good business development before similar economics take hold in other states as well. So, one effect of the ERCOT predictions will surely be to increase the pressure on policy makers not to shield existing fossil-fuel generation from healthy competition. It’s worth looking more closely at ERCOT’s specific findings. By 2031, ERCOT predicts that between 14,500 MW and 27,200 MW worth of new solar farms will be built. Under such a scenario, solar’s share of the Texas grid would rise from under 5 percent to 15 percent. Meanwhile, according to this forecast, no new gas or coal plants would be built unless extremely hot weather were to develop in the state. The implication is clear: the economics of renewable energy has overtaken politics in Texas. Not only has the introduction of competition squeezed out inefficient fossil-fuel burning plants and rewarded renewable energy, but these same economics are driving Texas to cut carbon emissions. Sure, in the political realm, Texas is leading the court fight against the federal carbon reduction requirements, known as the Clean Power Plan. But this stance is rendered purely symbolic when Texas’ own deregulated market is moving the state rapidly towards the same clean-energy outcome. So, how did this happen? It is notable that Texas, along with 29 other states, primed the pump for renewable energy—and learned a great deal in the process—by including a renewable energy content requirement in state law. Texas created a Renewable Energy Standard (RES) in 1999 when it deregulated its electricity market, requiring 2,000 MW of new renewable energy by 2009. That triggered such a boom in wind development that the Texas legislature raised the requirement in 2005 to 10,000 MW by 2025. Remarkably, Texas exceeded that state requirement 15 years ahead of schedule. Wind power currently makes up some 15 percent of ERCOT’s annual energy supply. Just as Texas helped prime the pump for wind power, other states help encourage demand for solar power with RES policies of their own. Such policies have led solar prices to drop some 70 percent since 2009. Just as predicted by proponents of renewable energy standards, those jump starts have helped both wind power and solar power to succeed in the marketplace. As more solar farms successfully beat fossil-fueled electricity generation on price—and more health benefits result from reduced pollution—more grid operators and communities will choose solar energy. 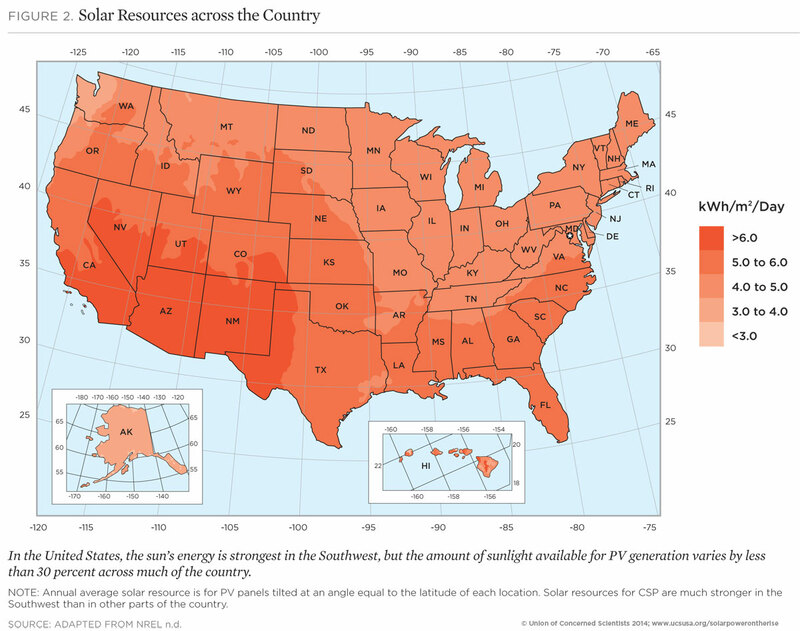 After all, lots of places across the United States—even surprising ones such as Georgia and North Carolina—are well suited to go solar. No matter what, count on one thing: With expected rises in natural gas prices and the continued trajectory of declining solar costs, this Texas phenomenon will certainly spread. I am sure that many like me hope that Texas’s opposition to the Clean Power Plan really is largely ‘symbolic’ at this point. I must note, however, that the fossil fuel industry is not simply going to quietly accede to these changes taking place. It has very deep pockets and huge profits at stake in regards to the future of power generation in this particular state and the country in general. Even on the so called ‘left coast’ where I live our progressive Governor who claims to be environmentally aware is reluctant to take a more active stance in regulating fracking, for example. The fossil fuel industry is powerful even here!